I’m lucky enough to have a job at RRT that encourages me to dream big. As a result, I have a bucket list that keeps growing and the opportunity to follow my dreams. My passion for climbing mountains led to the addition of one of my more ambitious goals to that ever-growing list, highpointing. Reaching the highest point in each of the 50 states is an alluring goal, and one that might take a lifetime to reach. It was this goal that led to my most recent adventure, a two week long road trip through the Northeast, climbing several high points in the process. A twelve hour drive brought us to Adirondack Park in northern New York. My old high school friend, Brian, had somehow been crazy enough to tag along on this trip. We hadn’t talked much in the two years since we’d graduated, but this road trip was a good reason to check a few things off my bucket list and reconnect with an old friend. Mt. Marcy’s treeless and rocky peak rises above the surrounding peaks and a beautiful green valley. 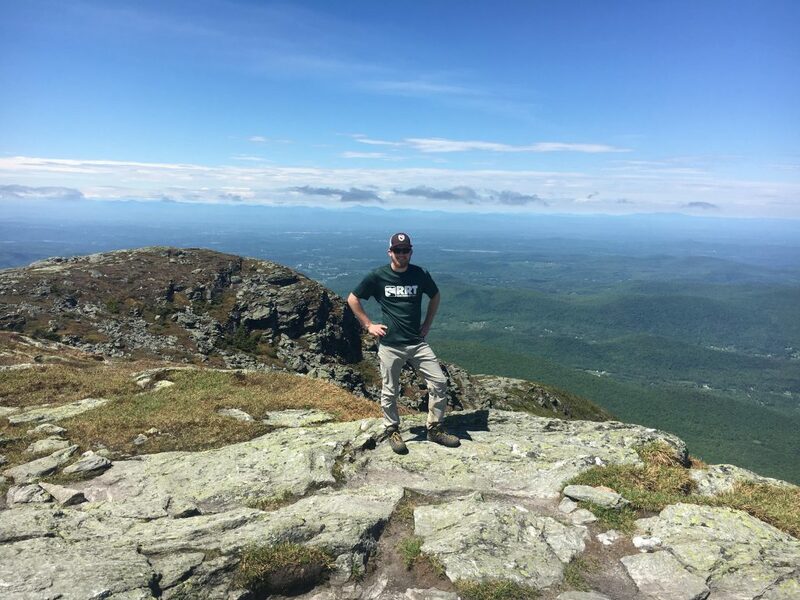 The highest point in New York is a challenging day hike, what proved to be a long 7.5 mile slog up the mountain. A cool, early morning start after an uncomfortable night of sleeping in the car had us on the summit by 11 AM. The climb up hadn’t seemed too difficult despite nearly 4,000 feet of elevation gain. The final half mile of the climb was completely exposed, above the tree line and on barren slabs of rock with jaw dropping views in every direction. The wind whipped across the exposed summit, so Brian and I hunkered behind a boulder for a quick lunch. I was surprised that I didn’t feel tired after the long climb, but I mistakenly underestimated the mountain before the descent began. If I wasn’t tired at the summit, I was completely exhausted by the time I had staggered the 7.5 miles back to the car, my knees throbbing from the steep, technical descent. Still, by 4 PM we had bagged the first peak of the trip and were driving towards the second. Somehow, in the brutality of the day’s hike, Brian and I had forgotten how miserable sleeping in the car the previous night had been. As a result, we spent another night in the car, this one at a movie theater parking lot in a small Vermont town. And as had happened before, the 5 AM sunrise woke us up long before our alarm went off. 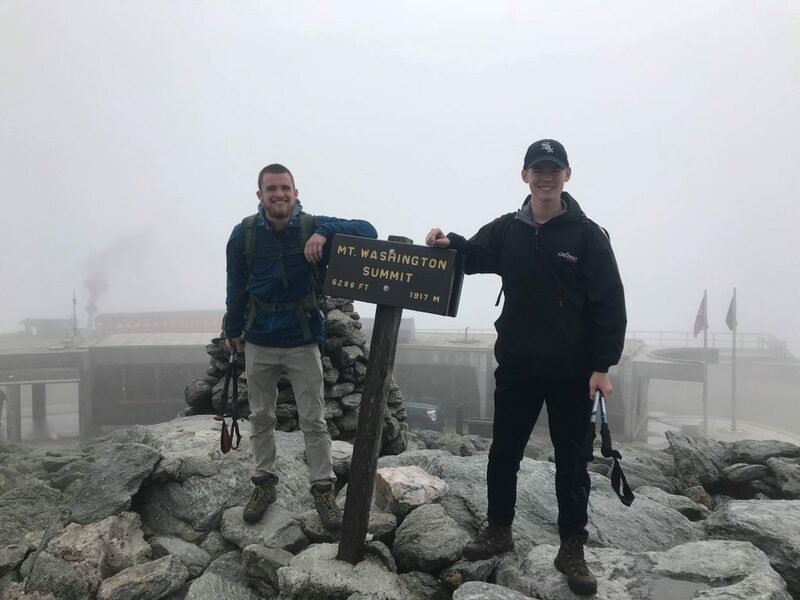 Even with sore legs, the 3 miles to the summit of Vermont’s highest peak was a breeze. The technical, exposed scramble to the summit was as beautiful as the day before, a reminder of why we climb mountains to begin with. Mt. Mansfield rivaled Mt. Marcy for one of the greatest hikes I’ve ever done, but the road trip had only just begun. Hours later and we were in New Hampshire, where we finally got smart and set up a tent just off the road. I’ve learned after numerous backcountry trips that being flexible is just as important as having a good plan. So after a day of rain disrupted our plans, we set off up Mt. Washington, the highest peak in New Hampshire and the highest mountain we’d climb on the trip. After surviving a 15 mile hike on the first day, we incorrectly assumed the 8 mile round-trip of Washington would be easy. 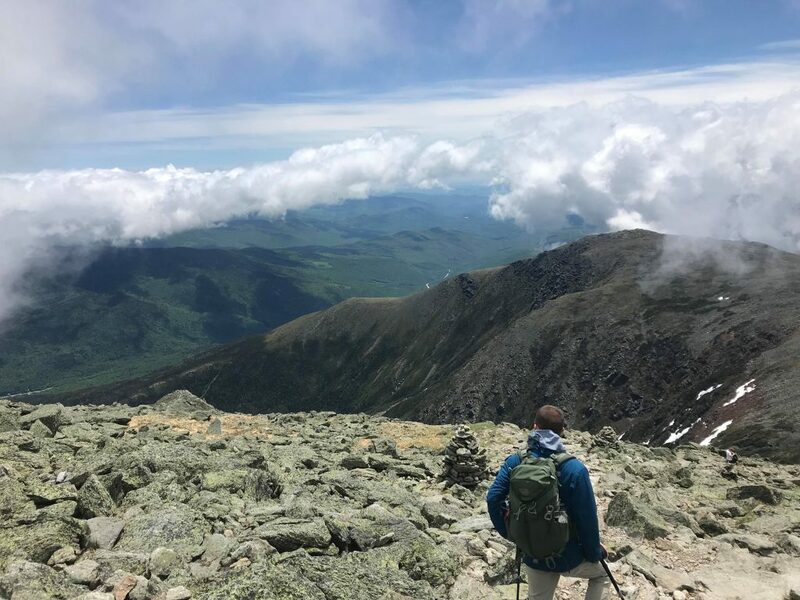 Even the “family friendly” Tuckerman’s Ravine trail and Lion’s Head route were steeper and more technical than I had imagined, but I loved every minute of it. As we climbed higher, again breaking above tree line, fog washed over the mountainside. We continued our climb, the fog growing thicker as we ascended. I figured the summit was close, but visibility was so poor it was impossible to tell. The clouds were so thick it was difficult to see from one cairn to the next, but we managed to find our way to the museum at the summit by mid morning and enjoy a few hours out of the elements. 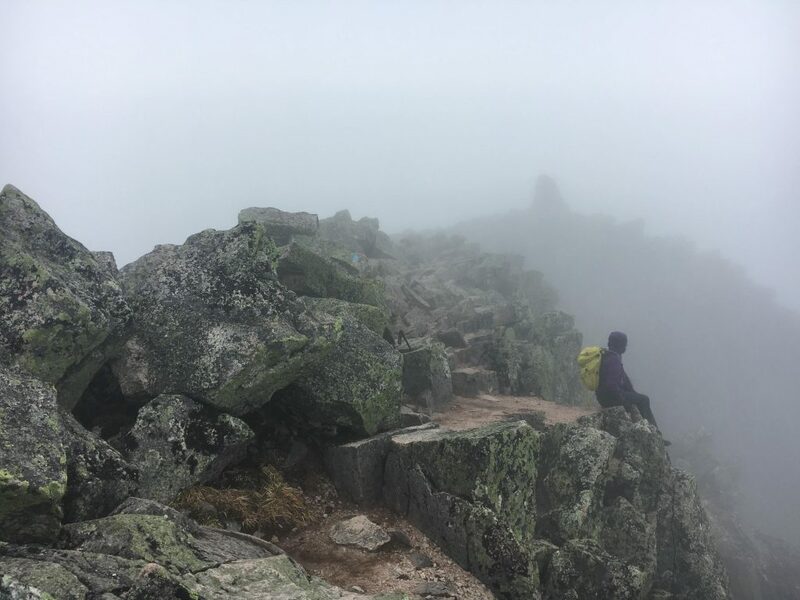 We’d climbed the highest point of 3 different states in a matter of four days, and now Katahdin and its infamous Knife’s Edge remained. Apparently the allure of the Knife’s Edge appealed to RRT’s own Olivia, because she flew from Cincinnati to Portland, Maine to join a now sufficiently smelly duo. She stunk upon arrival and fit in with this gnarly group. One would think that this far into the trip Brian and I would’ve learned that our expectations tend to be wrong, but we still hadn’t. 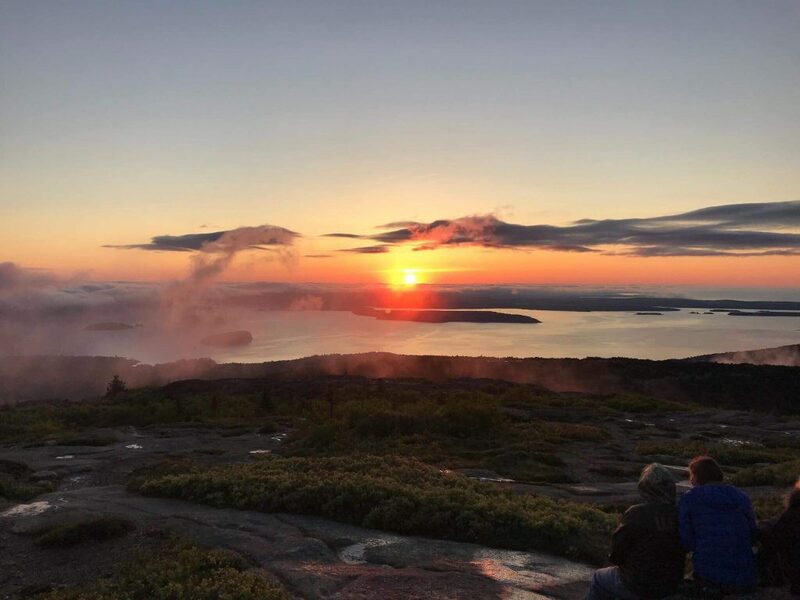 You won’t be surprised to hear that we spent another night curled into wildly uncomfortable positions in a parking lot in Maine, and our expectations of pleasant, cool weather in Maine were also wildly wrong. The “pleasantly cool weather” turned out to be the perfect temperature for swarms of bugs in Baxter State Park which tormented us the moment we stepped out of the car. With the bugs so bad, cowboy camping was no longer a good option, so the three of us squeezed into a two person tent and rested for the following day’s hike. Two miles into the hike up Katahdin we passed tree line, and from then on we were continuously pummeled by heavy winds. Winds that made traversing the bouldery slope very difficult and cumbersome. When arriving at the top of Pamola Peak we regrouped and discussed our options considering the winds were likely to continue and get worse as clouds were rolling in. Brian was weary and decided to turn around with another group of hikers, fearful of the winds and satisfied with his peaks bagged thus far. Olivia and I pressed onward down and up the 60/70 foot saddle-scramble to the Knife’s Edge. Something about the 20-30mph winds was appealing especially on this butter knife. It was technical hiking and the winds made us question our chances of success, but we pressed on despite a narrow margin for error. After somewhere close to an hour of precarious scrambling, we crouched behind a boulder, out of the wind, for a quick calorie boost. We chose the perfect snack spot because we reached the summit within a few minutes of leaving. It was intensely gratifying to reach the summit, a feeling of accomplishment that is hard to describe. 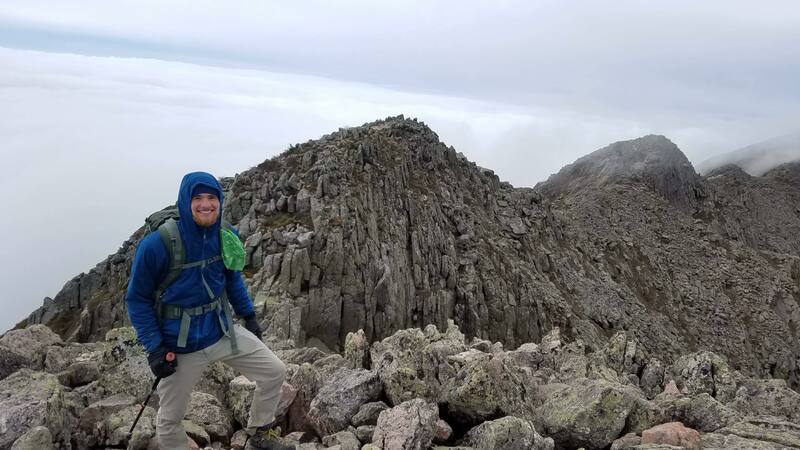 I had first climbed Katahdin via the Hunt Trail almost two years prior, and now was fulfilling a two year dream of summiting Katahdin via the Knife’s Edge Trail. I wasn’t disappointed at all in the lack of a view, I was completely content with standing back on top of a mountain that means so much to me. 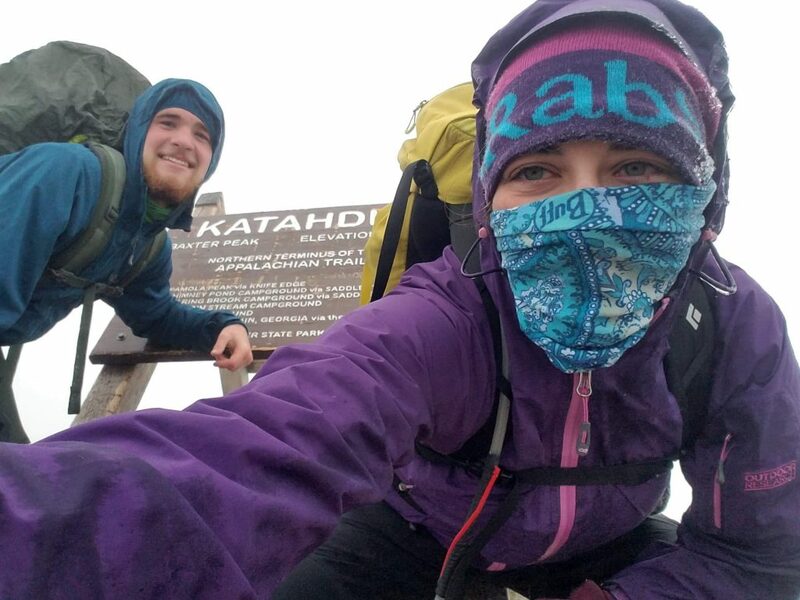 It was exciting to share the summit with Olivia, but wet weather put an end to our summit celebration. After a few pictures and jumping jacks, we began the long, wet descent. As temperatures dropped, the combination of wind and rain left rime ice on plants and rocks that added a new challenge to our descent. We traded complaints about sore joints and bruised ankles throughout the four miles back to camp, where we found Brian asleep in the car. With our goal accomplished, we continued our travels the following morning at Acadia National Park. Sometimes plans fall into place and work out better than you could have imagined. For our trip, Acadia was one of those times. We were lucky enough to stay in an oceanfront cabin owned by a friend of mine just a short drive from Mount Desert Island. We spent our short visit checking out Bubble Rock, Thunder Hole, Sand Beach, and a serene lighthouse. 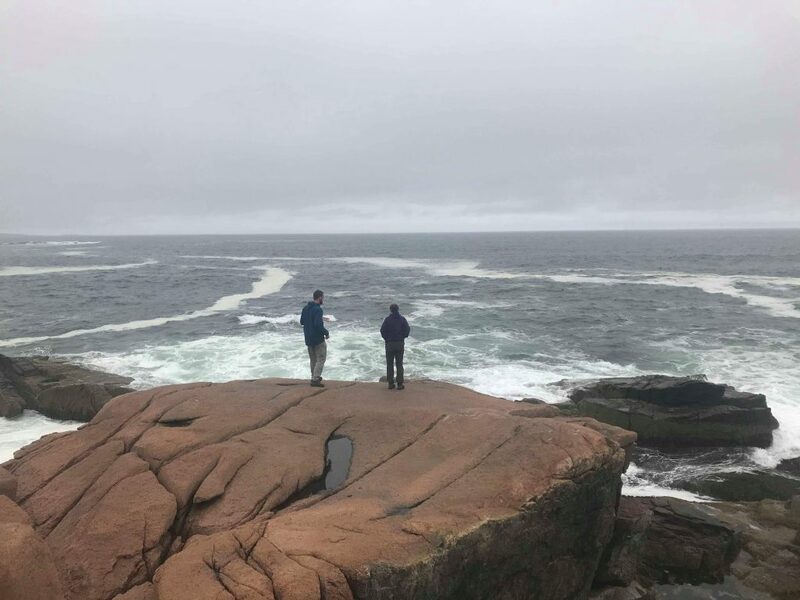 We also managed to explore Bar Harbor, try out bouldering at Otter Cliffs, and become a kid again at a pirate themed mini golf course. It wouldn’t be a trip to Maine without lobster, so we let our host show us how to properly consume one. I managed to enjoy all the best of Acadia with some great friends and meet up with an old one. The road trip I had spent months planning and dreaming of had finally arrived and gone by in a blur, and was now nearly over. All that remained was an 18 hour drive in a poorly air conditioned and temperamental ‘99 car back to Cincinnati. 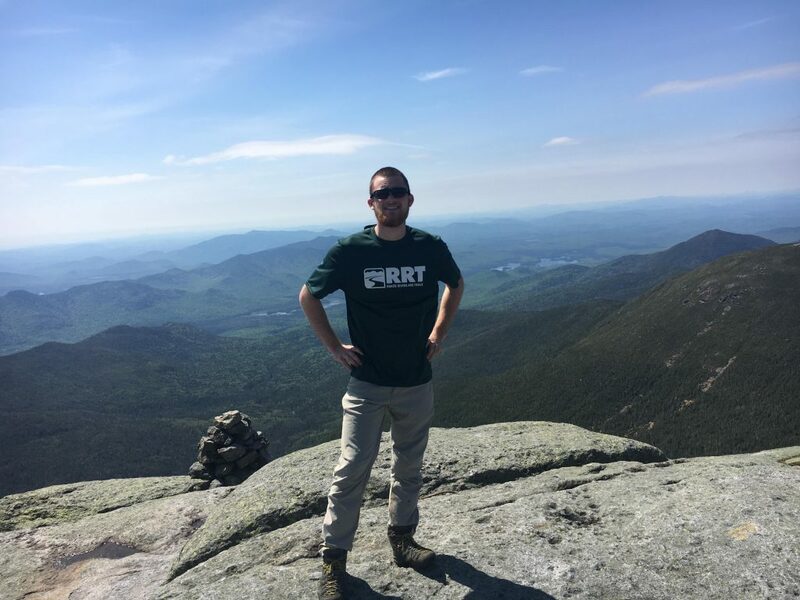 We prolonged the trip with an night in Massachusetts to check out a spectacular natural waterfall and enjoy pancakes cooked by former RRT gear expert Louie. Every climb on the trip had been worth the reward at the top and every long stint in the car worth the memories made. The trip had been an absolute blast, less of a vacation and more of an adventure- just how I like it. My bucket list hasn’t gotten any shorter since that road trip. Truthfully it’s probably longer and growing faster than Pinocchio’s Nose. But even if I never complete a bucket list, that’s not the reason we make them. We make bucket lists so we can go off on adventures we otherwise might not and make memories that aren’t soon forgotten. In the end we realize, as I did somewhere in those wild two weeks, that what’s important isn’t checking goals off a list but enjoying all the time spent outdoors working toward them.